Last week we celebrated 7 years of marriage! This sort of accomplishment definitely deserves a nice meal out and a few drinks. We really fancied something spicy and somewhere that was easy to get to so decided on the Valley Junction restaurant in Jesmond. The Valley Junction is owned by the same people who run the infamous Newcastle-Corbridge curry train. 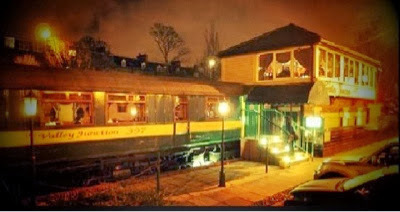 The restaurant in Jesmond is stationery but the train theme is still there - in fact half of the restaurant is a converted train carriage! There is plentiful free parking outside. Valley Junction has an upmarket feel and it is the sort of place you would go for a special treat - it was mostly couples and a few large groups. The service throughout was just fantastic. From the waiter promptly taking our orders, to the manager circulating and checking all of his guests were happy to the way all of our food was brought out at the same time so there was none of that awkward waiting around. We really were made to feel like a guest and not an inconvenience. The food was also delicious, we ordered popadoms and dips to start - lovely to see the dips were in plentiful supply and then I ordered chicken madras, pilau rice a garlic naan. Everything was perfectly cooked - the naans were nice and fresh, chicken very tender and the sauce was hot and full of warmth but not so hot that it makes your eyes water! Hubby ordered his new favourite dish - chicken dupiaza with mushroom pilau and garlic naan. He describes the dish as being full if flavour with a spicy kick (but not overpowering). We also enjoyed a couple of large cobra's each to wash our meal down with. 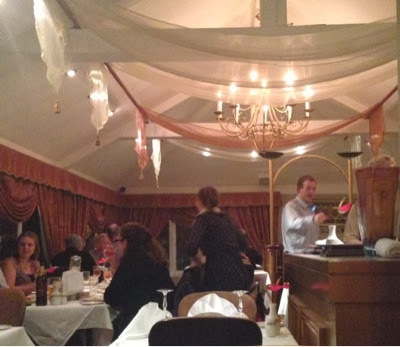 The bill was just short of £50 which is on the expensive side for what we had, however as it was a special occasion and the ambience, food and service were all faultless I think this price is absolutely worth it. There were lots of little touches at the end such as chocolate business cards, hot towels and free coffee refills at the end of the evening which are all lovely touches to end a special treat. You just need to cross the carpark to find yourself at 'as u like it' which is a bar, restaurant, function room and terrace. We have been a few times and really like it here. There is a good mix of people and you don't feel out of place when you're nearly approaching the grand age of 30 like you might feel in some of the bars in town. On the night of our visit there was a live band playing a selection of soul and groove music mixed with a DJ playing disco hits from the 70s through to present day. The bar was busy, but we still managed to get a table and enjoy our night. When I visit a cocktail bar, I have to order a cocktail! I think the menu could have a little more variation and I was disappointed to hear that the frozen cocktails were not being served that evening due to a problem with ice. There went my raspberry daiquiri! 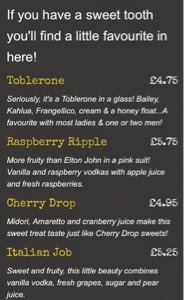 Instead I ordered a toblerone cocktail which was enjoyable, however there was no sign of a honey float and our waitress obviously did not attend charm school! We seemed to be greatly inconveniencing her by asking her to make us a cocktail!. 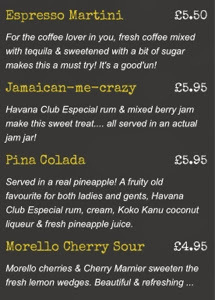 Next, I decided to try a piña colada, which I was expecting to arrive in a pineapple as described on the menu! It appears I was short changed though as there was no pineapple in sight (well apart from a token pineapple leaf used to decorate my glass) This cocktail was delicious though and it is nice that it was freshly made rather than pre-made like many piña coladas are these days! We only managed 2 drinks before it was time for our taxi to take us home. Overall we had a lovely night and will definitely be visiting this area of Jesmond again soon - think we'll stay away from the cocktails though and maybe opt for a bottle of wine at as u like it instead.